Following the establishment of parts surveys in North America in 1961, Jeffery Harrison (of WAGBI, now BASC) and Hugh Boyd (of the Wildfowl Trust, now WWT) initiated the UK Duck Production Survey in 1965. This took place annually, supported by ~200 committed wildfowlers who submitted on average 3,000 wings per year, reaching 6,600 wings in 1995/96. 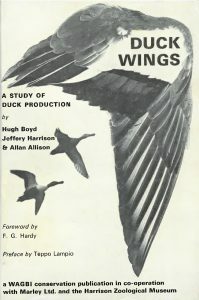 It also resulted in the seminal publication ‘Duck Wings’ (Boyd et al. 1975). Wing surveys were soon established elsewhere in Europe too, and concerted attempts at international coordination were made in the 1980s and 1990s – see Harradine & Clausager (1990). 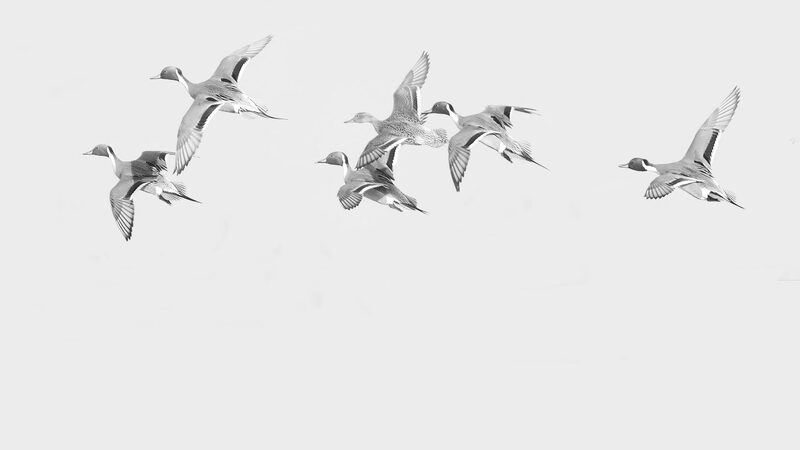 BASC and the Danish Game Biology Station (now part of the Department of Bioscience at Aarhus University) established the European Duck Wing Survey in 1984, involving nine countries stretching from the Baltic to the Mediterranean. Unfortunately, however, a number of these national duck wings schemes faltered during the late 1990s along with the flyway-wide coordination. Given the increasingly urgent need for a better understanding of the demography of European duck populations, as well as better harvest statistics, the DSG is working to support the initiation of new national duck wing schemes and improved international coordination. Here we provide a summary of ongoing work and access to relevant information and tools to support the development of new national or regional schemes. Established national schemes operating annually currently exist only in Denmark and France (see also here). Other short-term surveys have recently been carried out in Finland in 2005-07 and 2014-16, and Iceland in 1993-2000 (Frederiksen & Sigfusson 2004). Other short-term surveys have been carried out in a number of other countries, including Russia, but further information from them is not currently available. In the UK, a pilot scheme was initiated in 2017/18 by BASC and in winter 2018/19 this is being expanded to a national scheme. The DSG and active national partners are working to support the establishment of new duck wings schemes and re-establish European-wide coordination. 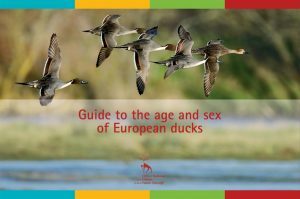 In order to support this and the collection of accurate data, the ONCFS have produced an excellent guide to the ageing and sexing of commonly hunted ducks (Mouronval 2016). This guide is available to purchase or download from ONCFS. It has also been translated into English and this version is also free to download or hard copies can also be purchased from ONCFS. Publication of the English version was supported financially by BASC, and also supported and promoted by FACE. We encourage all national and regional game management authorities to investigate the potential for the establishment of new schemes. Experts within the DSG are available to provide technical guidance to support this, e.g. regarding the use of standardised methods. Please contact us if you would like to discuss this further. We also welcome information from existing or previous schemes that could be added to this web page to make it the most comprehensive resource possible. Additional identification tools are available covering North American species and further related information from North America can be found here and here. Boyd, H., Harrison, J. & Allison, A. 1975. Duck wings: a study of duck production. WAGBI, Marford Mill. Frederiksen, M. & Sigfusson, A. 2004. Wing survey of geese and ducks 1993 – 2000. Icelandic institute of Natural History, Reykjavik. Mouronval, J.B. 2016. Guide de détermination de l’âge et du sexe des canards. Office National de la Chasse et de la Faune Sauvage, Paris. Download in French or English.